Most of the time it's pretty easy to find out which city or county a project is in. 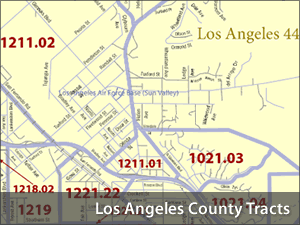 However, finding out which Census tracts a project is in is more difficult. For example, you could look at Google maps and figure out that your area of interest is in Burbank or Los Angeles County, California. However, Google maps won't tell you that the tracts surrounding your area are Census tracts 4040 and 4041. There are 2 different Census Tract Finder tools that you can use to identify tracts that intersect your project area. Next, you could use the US Census Bureau's site with Census tract maps by county. However, some planners have mentioned that the images provided by the Census Bureau are difficult to read. It's challenging to figure out where your project area is on the map and which Census tracts are in the area. However for other projects, these images should work just fine. Finally, if you have an address and you want to know what Census tract intersects just that address, check out the Census Bureau's finder tool. It's missing some addresses, so it's not a 100% guaranteed way to find Census tracts. But if your address is included, it's pretty easy to use.